Since I am, under normal circumstances, quite possibly the worst cook ever, my amazing little sis Morgan is usually the official recipe poster around here. From time to time however, a miracle occurs and I come up with something delicious in the kitchen. I happen to think that this recipe makes the very best roasted pumpkin seeds I've ever had (as does my husband, who has been consuming full batches in a matter of minutes). Therefore, this will be one of the rare occasions that I post a food-related DIY that I did all by myself (yes, I am 5). If you'd like to check out some of the other recipes we've shared here in the past, from homemade cinnamon rolls to black bean and sweet potato tacos (thanks to Morgan the chef), click here. 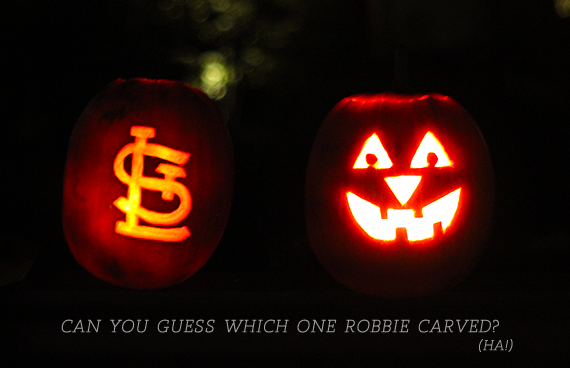 One of my absolute favorite things to do this time of year is to carve pumpkins. The smell alone evokes instant memories of my childhood and the blissful anticipation I'd feel as I counted down to that one magical evening where I could be anything I wanted to be (and collect excessive amounts of candy as a bonus.) As an adult, I still love the entire process: picking out the perfect pumpkin, bringing it home, lying out newspaper, and carving out pieces until that quintessential face of a jack o' lantern appears. 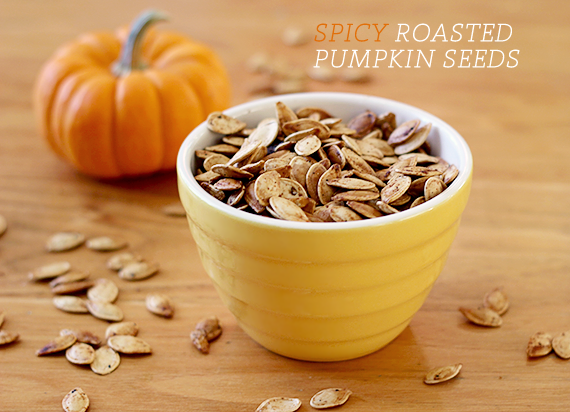 I'm of the strong opinion that the best part of carving pumpkins is roasting the seeds. Late October is really the only time of year when I get to enjoy this snack fresh from the oven, all warm and crunchy and full of flavor. 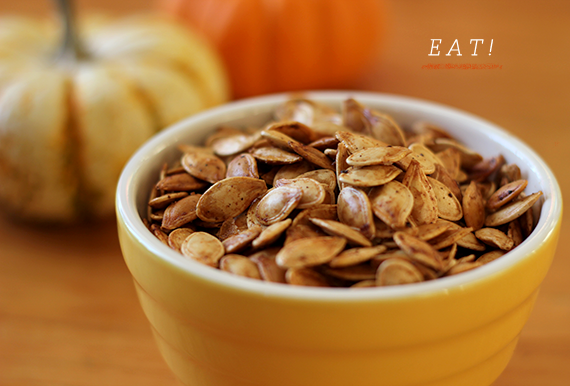 Pumpkin seeds are also an incredibly healthy snack, packed with zinc, magnesium and fiber. This year, I decided that I wanted to add a kick to our regular recipe. We picked up some amazing chili powder and dried chili peppers on our recent trip to Santa Fe, and I figured if these spices taste as good as they do in other recipes, they'd have to taste at least as amazing when added to my beloved pumpkin seeds. I was right! 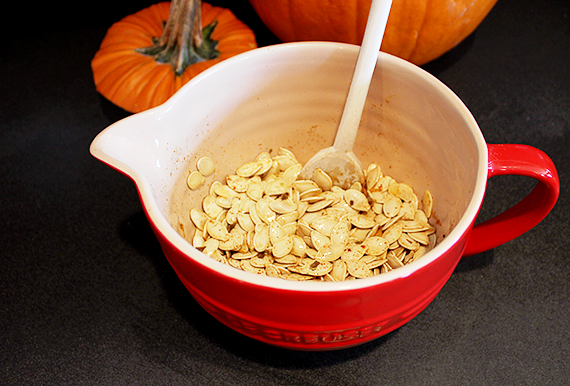 This recipe is ridiculously easy, especially if you're already gutting a pumpkin to carve it. You'll also have a tasty snack to reward yourself when you're done creating your jack o' lantern masterpiece. 2. 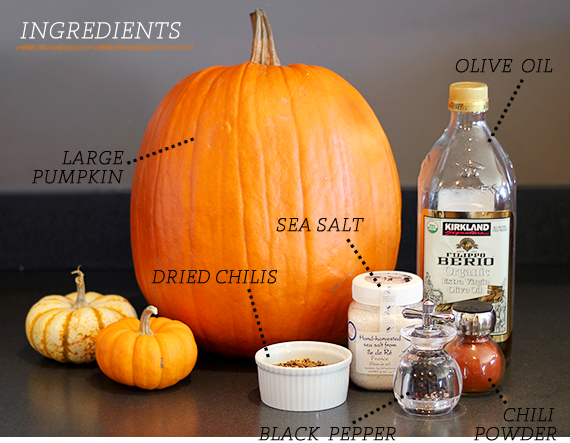 Cut off the top of your pumpkin, remove the pulp, and separate the seeds. 3. 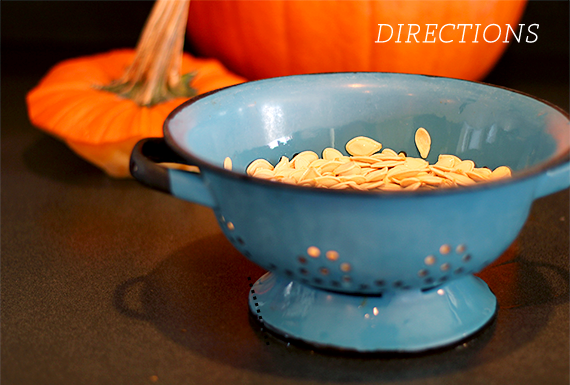 Rinse the seeds in a colander. You can leave a small amount of pulp (it adds flavor), but make sure all of the large chunks are removed. 4. Transfer your seeds to a medium sized mixing bowl and add the olive oil. Toss. 5. Add sea salt, black pepper, chili powder, and dried crushed chili pepper, and mix well. The amount of spice you add depends on how much of a kick you want. My advice is to add a little at a time, taste test, then add more as necessary. You can also add a few dashes of celery salt for a more savory flavor. 6. 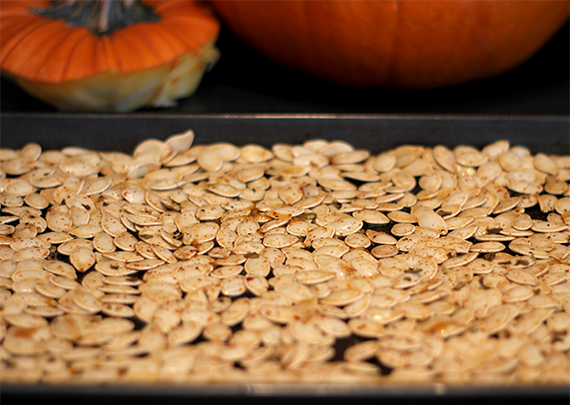 Spread the coated seeds evenly in a single layer on a baking sheet. 7. Set your timer for 45 minutes and place seeds in oven. Use a spatula to stir your seeds every 10 minutes or so. 8. After about 30 minutes, taste your seeds and see if you need to add any more spices. I added some extra salt and chili powder to mine at this time. 9. Remove from oven, let cool for a few minutes, and EAT! I hope you guys enjoy this deliciously healthy fall snack as much as I do. If you're not completely gluttonous like I am and would like to keep your spicy pumpkin seeds around for more than a day, you can store them in an air-tight container for up to a week. 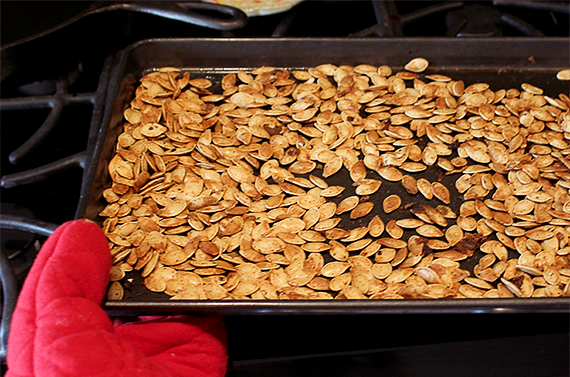 I love roasted pumpkin seeds, they are so easy to make and healthy, too! Can't beat that. I'm going to try your 'spicy' recipe, I usually just make mine with salt. Yummy!!!! I will have to try this for sure! Totally gonna try this recipe! Thanks for sharing. =0) We'll be carving our pumpkins this weekend, and I'm sure we'll have plenty of seeds. I've been meaning to make these. Thanks for the recipe Morgan! These sound so yummy! We're carving our pumpkins Sunday and I'm for sure going to make these. Yum! I love pumpkin seeds. Too bad I don't have a pumpkin...or an oven. I can't stop eating them whenever I make them... :) And cajun type spiced seeds are my fave. I have to do some with just garlic salt for my daughter as she doesn't go for the kick of the peppers, but my personal preference is the chili spiced kind like this. Yum!! Ohhhh spicy sounds so yummy! Love pumpkin seeds! !